Noticed this one the other day, if you have a pipeline job with build parts in the queue and you're looking at a view with the filter build queue option, then the build part doesn't show up in the build queue. 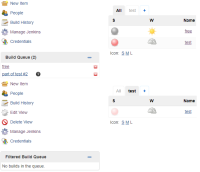 Notice how the build queue is empty in the second image while there clearly is a build part queued for the job test in the main view. The problem is that, in hudson.model.View#filterQueue(List<Queue.Item> base), it only checks if the queue task is in the list of filtered jobs, however that is not true for pipeline parts as the task is a step and not the job it self. To solve this, simply also check if Queue.Task#getOwnerTask() is in the list of filtered jobs (do this recursively). // Check if the task of parent tasks are in the list of items. // check owner tasks as well. // Check root project for sub-job projects (e.g. matrix jobs). JENKINS-46759 Fixed bug related to views which filters build queue, jobs which has multiple sub steps were filtered incorrectly. Added test case for build queue filtering in views. JENKINS-46759 Improved code based on feedback from PR; Fixed logic bug, moved logic to separate method and added limit to number of iteration when looking for owner task. SCM/JIRA link daemon added a comment - 2017-10-14 09:49 Code changed in jenkins User: Jon Path: core/src/main/java/hudson/model/View.java core/src/test/java/hudson/model/MockItem.java core/src/test/java/hudson/model/ViewTest.java http://jenkins-ci.org/commit/jenkins/ce2d0f97bdbb5fb171443559d210dffef7961dc2 Log: JENKINS-46759 Fixed bug in build queue filtering for views (#3008) JENKINS-46759 Fixed bug related to views which filters build queue, jobs which has multiple sub steps were filtered incorrectly. Added test case for build queue filtering in views. JENKINS-46759 Improved code based on feedback from PR; Fixed logic bug, moved logic to separate method and added limit to number of iteration when looking for owner task.